dith Scholl received a Bachelor of Music degree from the University of Michigan, where she studied composition under Homer Keller and Ross Lee Finney. 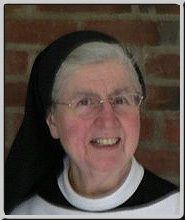 In 1956, she entered Mount Saint Mary Abbey, a contemplative community of Cistercians (Trappistines). She has written music for the community's liturgy: Mass Ordinaries and Propers, hymns and antiphons, but also a few choral pieces. Since I was immersed in nothing but Gregorian chant for years, the chant has been a major inspiration, so my music is generally modal, and the rhythm tends to be free. I have tried to do for English something of what the chant does for Latin. I have also tried to follow the principle of Joseph Gelineau: "liturgical music is not a matter of music for music's sake, but of entering, through music, into the mystery of salvation." For me, the text is paramount; the music is at the service of the text, and the singers at the service of text and music. And it is not so much a question of inventing music, as of discovering the music that is latent in the text. I have always considered providing music for worship both a privilege and a responsibility.